Zombie ants are intriguing to scientists. 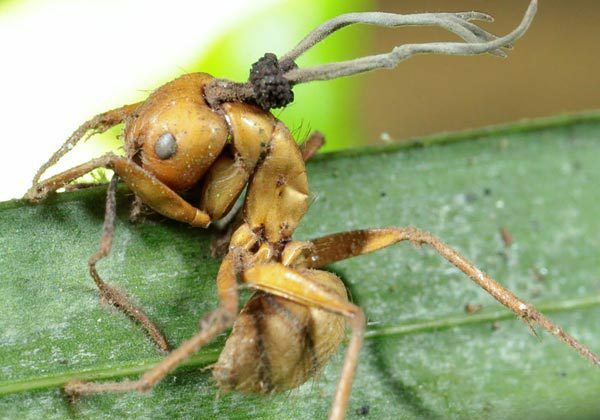 The zombie part happens when a fungus takes control of an ant’s brain, in order to reproduce, eventually forcing the ant to attach itself to a leaf or twig before killing it. After the ant’s death, the fungus grows and later sprouts a stem. Spores will be released to infect other ants, turning them into zombie ants. But while the surface process is well-known, the underlying mechanisms remain a mystery, prompting Charissa de Bekker, a postdoctoral fellow at the Hughes Lab at Pennsylvania State University, to ask the public to help fund planned research into the zombie ant phenomenon. “This research project aims to unravel how this parasite establishes zombie-like host behavior by discovering the genes that are important,” she added. De Bekker has already performed experiments in which infected ants were sampled at the moment of “zombie” biting behavior, and after death. From the cells gathered, RNA will be extracted and amplified. The expression of the genes in play will be looked at, and the samples will be used for RNA sequencing, done by experts of the sequencing facility at Penn State University. “This will result in a wealth of data which will not only help me answer the main research question for this project, but will also provide me with extensive information that will become helpful in and could form the basis for future projects,” de Bekker said.